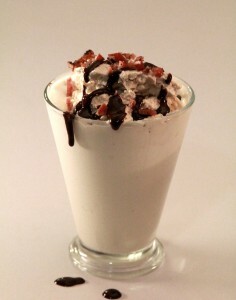 Jack in the Box’s newest dessert menu item, their bacon milkshake comes in at 770 calories and 89 carbohydrates. Mine comes in at 1100 calories and 8 carbohydrates. Granted, I add more zhoozh to mine, so it’s going to be fattier and more flavorful (read tips below for cutting fat and calories). The review: This low carb milkshake is filling. I had one and it was a meal. This milkshake is delicious. I am a tough sell when it comes to sweets. I don’t even like sweets. So for me to sign off on this is pretty major. It’s the perfect combination of fat to sweet and savory; and, believe it or not, the slight salt in the optional, chopped bacon bits really adds some amazing chew to the overall result. The result? Love. Love love love. Want to cut calories and fat? Use coconut milk or almond milk in your shake in place of the heavy whipped cream and skip the whipped cream topping and optional bacon bits. Do not skimp on the bacon fat and the maple flavors; they really make this delicious. Cut calories with the milk replacements. The ice cream you can use varies. I used LC Food Corp’s Vanilla Ice Cream mix because it’s quick and easy. (Read more here for my simple process.) You may use commercial, low carb ice creams, but beware maltitol. I buy my Brown Sugar blend from Kroger. Look for the purple bag in the baking aisle. Their site. If your shake is too thick, add water to thin out the cream, 2 Tbsp at a time. This recipe is not Atkins induction friendly, but it is low carb. This recipe is gluten free and sugar free. No, it’s not for daily consumption. Even though this one is friendly to the blood sugar, who drinks milkshakes on a regular basis? Any other questions? Drop me a comment below! 1. In large mixing bowl, whip heavy cream with maple extract and sweetener on high speed until stiff peaks form, about 3-5 minutes. Set aside. 2. Mix ice cream with other shake ingredients in a blender. Spoon/pour into two glasses. 3. If using whipped topping, top shakes. 4. In microwave safe bowl, heat chocolate syrup ingredients, mixing every 20 seconds, until all ingredients are incorporated. Drizzle over shakes. 5. Optional: Serve with crumbled bacon bits. BRILLIANT!! You continue to amaze me! Thank you! I hope you like it, too. I thought it seemed incredibly nasty sounding. And then I made one. The flavors are just right. I really really enjoyed it. Hmm this sounds like heaven in a glass! Ill have to look into getting some of the ingrediants and make one ! I’m so happy.I saw their commercial. Just the fact that you have bacon fat as an ingredient makes me smile. Brilliant! YES! I WILL be making this. Because not only do I have a sweet tooth but I have a bacon tooth. I love it– bacon tooth! Heavenly! After being on HCG for the last 35 days (5 more to go) this looks like “yummy for my tummy…” How much is a scoop? I know one serving of LC ice cream is 1/2 cup. i think i love you… whoot! go bacon! Bay-cohn! We love it! And the flavors are pretty mild. It looks like a weird drink, but wow. It’s just the right amount of salty/chewy/sweet. Um…….. Me! Which is why I’m now on low carbs. A bacon milkshake is not very heard of. Thank you for sharing this low carb treat. I’ll bet you could make your own ice cream! I am now officially even more adored by my Bacon-loving guy. I couldn’t finish mine, so it’s in the freezer for later. I am so glad it’s been a hit. I really loved the one I made. It was so big I was able to share it with everyone. Long live bacon! Wow, just discovered your site. I’ve only discovered low-carbing in the last month or so so I’m still getting my footing, but I’m in awe at what you’ve got laid out here. I’m feeling a little overwhelmed by the volume of your output (though also inspired). Wondering if you are coming out with a recipe collection, or perhaps even an e-book to help wrangle your creativity into a handy index. I’d happily buy a copy for all your hard work. Conventional book stores out there are under-represented by lc books. Anyway, carry on, you are the best. Thanks so much for taking the time to write! You rock. I found this recipe just in time for my husbands 30th birthday next week! This will be THE perfect treat to make him! Thanks! I so freaky love the recipe. I totally do! Happy early Birthday, hubby! Hey Jamie, which low carb ice creams do you recommend? Do you find too much artificial sweetener kicks you out of Ketosis? Hi there! I typically go with frozen yogurt. You can make your own by adding sweetener to yogurt and vanilla, freezing for about half an hour to 60 minutes and then making the milkshake. Wait, let me get this straight. Adding sweetener and vanilla to a plain yogurt and freezing it, then using it in the milkshake!? Does it taste good? How much sweeter per cup of yogurt? Hi, Amy. Yogurt is a little more tart, but you know what? That’s okay, I think, especially with brown sugar, bacon and maple flavoring. To me, those sound like a nice combination of flavors. I think I have seen it all now, a bacon milk shake! 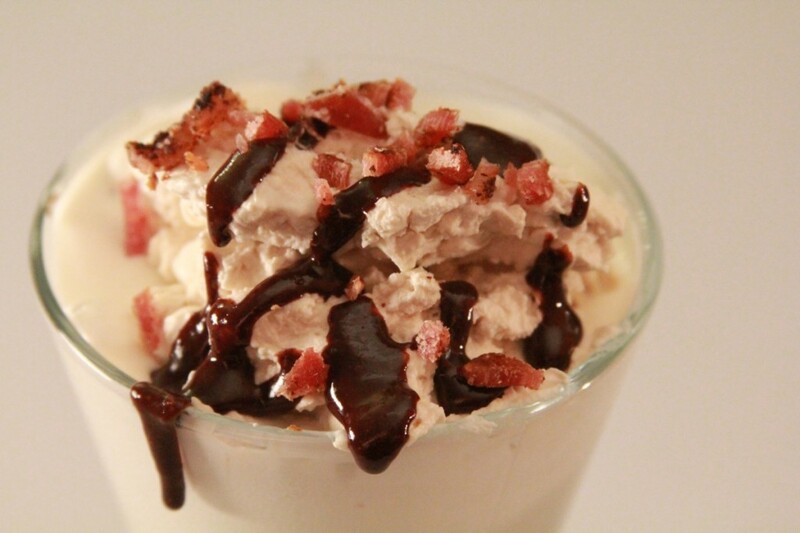 Count me in, I love bacon, never thought about trying it with ice cream until today. It does look and sound delicious. The low carb ice creams are awful in Canada….I was thinking…a fair substitution might be 8-10 frozen ice cubes of almond milk…with a dash of stevia and vanilla! Whizzed in a powerful Ninja blender and proceed as usual…it may even reduce the carb count…for SIlk brand of unsweetened almond milk is ZERO! ZERO carb is quite fine, indeed. Just a post script – that chocolate sauce – is divine. It’s like a cross between hot-fudge and that chocolate dip that hardens on cones. I have really missed both. Bless you Bacon Mistress! Awesome! I am so glad you like it! Your comment made me snert.